It was November 29, 1997 and I headed out for an afternoon hunt. My bowhunting partner took a ride upstate with my brother to do some skiing in the Old Forge are. But I stayed home to hunt. The day was really nice. The temperature was around 38 degrees and the wind was fairly still with clear skies. This particular spot that I was hunting took about a half hour to get to from where I had to park. I had to cross a set of railroad tracks that acted like a magnet for big bucks in this area. Maybe because the tracks ran through thick marshes, low lying swamps and dense brush. You couldn't ask for better big buck habitat. My stand was set to about 24 feet and I was settled in at 11:30 am. There had been a lot of buck and does activity in this spot. I was a little down wind from two major trails merging into one that took deer down to their evening feeding spot. The rubs in the area were very big and there were breeding scrapes from high caliber bucks. I saw one with antlers so big , I thought I was in Colorado hunting mulies!! I sat all afternoon without seeing anything but birds. When 4 pm came the woods got nice and quiet and very still. I saw four does come in steadily but unspooked. Two were mature does and the other two were smaller. One of the big does trailed behind and lingered a bit. The buck was coming! I saw his antlers first as his nose was close to the ground gathering up the doe's scent. He looked totally awesome coming in. When the does noticed him they almost looked frightened. He was working the whole area where the does had been, which gave me my only opportunity for a shot. He turned away quartering. I took full draw, locked on his right lung, and released my arrow. The buck had never stopped completely for me so my release was almost instantaneous. The arrow stuck him perfectly in the back of his right lung and excited low to the left and through his heart. The shot was 23 yards. The buck ran maybe 60 yards, stopped, snorted, and looked toward me. I honestly thought I missed him until I saw his back legs start to stagger and give out on him. As soon as he went down I came down. It was 4:20 pm as I made my way to my trophy. I was overwhelmed with the sight of this beautiful 9-pointer with a 22 inch spread. There was nobody there to share the excitement with until they met me that evening to help drag. 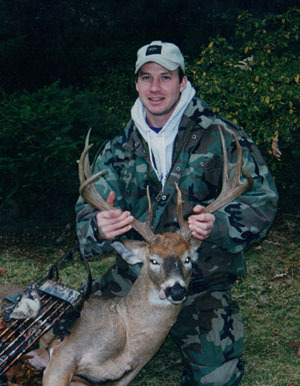 Tim Connor's buck scored 132 4/8 P&Y and is entered in both the Pope & Young and NYS Big BUck Club.